False-color scanning electron micrograph of a nanophotonic motion sensor. Vertical motion of the silicon nitride ring (pink) changes an evanescent light field of the silicon disk optical cavity (beige) a few hundred nanometers below it. (Phys.org)—Using a microscopic optical sensor that can be batch-fabricated on a silicon chip at low cost, researchers from the NIST Center for Nanoscale Science and Technology have measured the mechanical motion between two nanofabricated structures with a precision close to the fundamental limit imposed by quantum mechanics. Combining a microelectromechanical system (MEMS) with a sensitive optical resonator that can be accessed using conventional optical fibers, the device provides a model for dramatically improving MEMS-based sensors such as accelerometers, gyroscopes, and cantilevers for atomic force microscopy. Traditional MEMS sensors depend on integrated electrostatic transducers with slow response times and low signal-to-noise ratios, and most scientific instruments that detect motion use bulky optics that require costly instrumentation, careful alignment, and mechanical isolation. 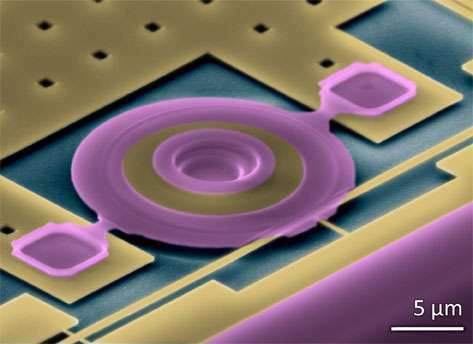 To overcome these difficulties, the researchers created a highly sensitive position detector that relies on a silicon microdisk optical cavity that is only ten micrometers in diameter and has a similarly-sized silicon nitride ring suspended a few hundred nanometers above it. The proximity allows the evanescent light at the surface of the disk to interact with the ring, and changes in the strength of this interaction can be used to measure changes in the distance between them. The cavity has a high optical quality factor, meaning that light from an optical fiber can make several thousand round-trips in the cavity before leaking out, accumulating information about the ring's position with each round-trip. The cavity's very sharp optical resonance, combined with the high sensitivity of the optical mode to the disk-ring distance, enables precision displacement measurements close to the limit imposed by the quantum mechanical uncertainty principle. By using the signal from the optical cavity as an input to an electronic feedback circuit controlling a MEMS actuator that moves the ring, the researchers are able to reduce the Brownian motion of the actuator (the displacement caused by random molecular motion) by a factor of 1000. This feedback system effectively increases the mechanical force-sensing bandwidth by more than a factor of 2000, reducing the system response time to ten microseconds. The overall device achieves a combination of speed and precision that is completely unreachable with conventional MEMS sensors. It combines extraordinary sensing performance, low power dissipation, and wide tunability with the high stability and practicality of a fully integrated silicon microsystem. The researchers are now working to integrate these sensors and actuators into highly sensitive, stable and compact cantilever probes for atomic force microscopy.